Learning ,Contributing and Developing: Yesterday's 8 GB is todays 32 GB !!! 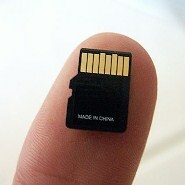 Yesterday's 8 GB is todays 32 GB !!! The story goes like this....I bought a 8 GB SD card from a leading "TRUSTworthy" electronics store in Jan'12 for Rs.1200.Now, in Jan 2013 This SD card conked out ! When I requested for Option 2, the store manager agreed. So, I had Rs 1200 /- to purchase. No extra money or difference of money was paid. How about to Store ? I understand the intangible gain like goodwill etc. Other than those intangible issues , Did the store Gain ? or No Loss-No Gain or Notional Loss ? Though noone measures P&L on single SD Card, If we were to compute what is the P&L?